Why did you start vaping and did you notice any health improvements ? To put things simply, when I started vaping, I did it purely for my health. I have been asthmatic since my early teens, something that crept up on me stealthily and quickly, initially coming to light during my school sports classes. I had problems breathing when long distance running, swimming etc. Then shortly after, I had a couple of full-on allergic Asthma attacks ( cats, pollen, dust... you name it ) which hospitalised me, and confirmed I was stuck with the affliction. Happily this has been under control for years with the appropriate medication, and generally, I get along fine. But sometime during my early Thirties, I started smoking. Yup, that late! Why? I don't know really, possibly work pressures, relationship issues, blah, blah, blah. Anyway, It was daft but I did. Since that fateful first day I picked up a cigarette and lit it, I was like millions of others. Addicted. Thankfully I was never a heavy smoker. Ten a day at most. But combined with underlying Asthma, the effects eventually started catching up with me. Over the years I started to develop what I call a "heavy chest", like I was on the cusp of a mild attack that never quite materialised. My overall lung capacity started to reduce, but I had my Asthma sprays to sort all this out. Just take a few more puffs every now and then. Sorted. But eventually, combined with a dose of middle age spread, came Sleep Apnea. I'd gotten used to Asthma. Cigarettes accentuated the condition mildly and in a way that I just came to live with. But the Sleep Apnea scared me. It scared my partner as well. The frequency with which I would start falling asleep and briefly stop breathing increased. The length of time I stopped breathing became longer. For me, it was jarring and panicky; the last few times it occurred I would wake up gasping like I'd been held under water. For her, this was just plain distressing to see and hear. This was the final straw. I HAD to stop smoking. Things were getting real. I initially tried Nicotine Gum. Couldn't stand it. I tried patches. Didn't 'hit the spot' at all. I even bought a cig-a-like from a petrol station. It was...a poor experience. Then my work colleague came in one day, sat at his desk, and started puffing on an eGo stick filled with mixed berry e-liquid. I was intrigued. He let me have a go. Like that fateful day years ago with the stinkies, I was addicted. But this time in the best possible way. Today, I am smoke-free. I am no longer shackled to the "thing" that caused me so much discomfort. I am seeing first-hand the clear benefits of vaping over smoking as an Asthma sufferer. I no longer get the "heavy chested" feeling. My lung capacity is greatly improved and I can happily use my Wall Climber to get some exercise in, helping me work off some of this flab I'm carrying around my waist like a turgid, hairy pink inner-tube. In fact most days I can easily forget that I am an Asthmatic at all, my only reminder being my main triggers - cats and pollen. The first I can avoid, the second I can take an antihistamine for. What has also carried me through all of this, and kept me off the cigarettes, is the fact that vaping has become much more than a cessation device. It's a full-blown hobby. 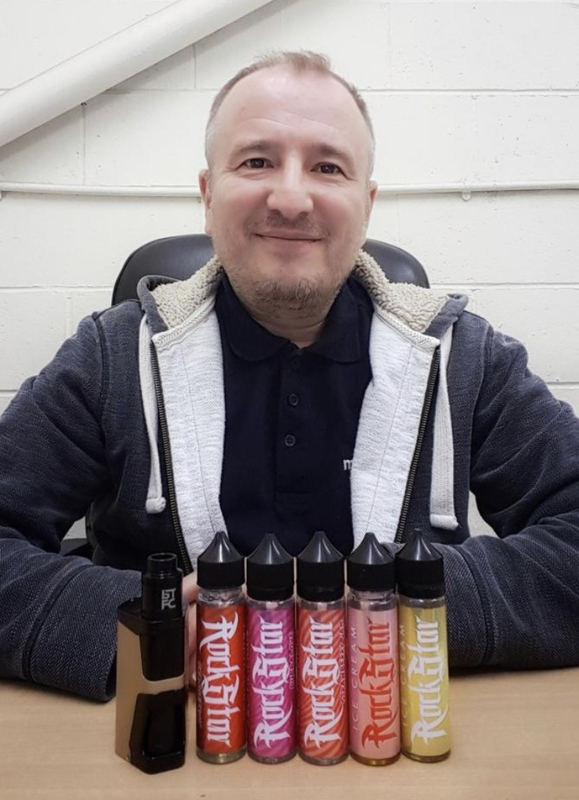 There are a multitude of e-liquid flavours to explore, a cornucopia of devices to pore over and lust after, all existing to keep my eyes, mind and never-to-be-yellowed-again fingers from straying back to the fags. Most importantly though, my tipping point issue has never returned. Sleep Apnea. I've NEVER suffered from this since I started vaping. Not once. Which is fantastic. Oh, and the missus is very pleased too. What would you tell a smoker about vaping if you were trying to convert them? Well, I'd recite the story above! Otherwise though, I'd be emphasising the fact that vaping is, according to the NHS and other reliable sources, 95% less harmful than smoking, and let's be honest, a much tastier and more enjoyable alternative! I'd say take any media scaremongering with a pinch of salt (salt nic even! ), as there are a lot of companies out there who's tobacco business is being severely threatened by the rise of vaping and will stop at nothing, up to and including dissemination of misinformation, to keep us on cigarettes. Do you have any stories about converting someone to vaping? I did manage to introduce my sister so vaping. I gave her a small mod with a low powered atomiser and a handful of different flavour juices. Two years later, not only did she stay off the cigarettes, she even stopped vaping altogether too! It had done its job perfectly, and so she passed the mod onto her friend to help her quit too. Result! What type of liquid and device did you use? I started with a vape pen, then very quickly moved to a small mod and sub-ohm tank, and now I'm loving the squonk mods. My first e-liquid was a 75pg / 25vg Blackcurrant & Liquorice. I know it's mostly a rose-tinted memory now, but it was a taste revelation! Where do you see the future of the industry? I'm really positive about the future of vaping and see it being in a healthy position in five years time. The last five years have seen a rapid increase in hardware and e-liquid quality and variety, a bit of a vape-boom. Then came the TPD restrictions which a lot of people thought would ring a death knell for the industry. It didn't. The result is vape companies that adapted and survived and are now in a position to consolidate on all that is good about vaping within these restricted boundaries, especially as the evidence in support of vaping and health benefits continues to grow. So to come back to the question in point. I see vape pods and nicotine salts really taking a hold and becoming the mainstay for the large casual sector of the market that is in it 'just to quit'. Nic salts just do a better job of replicating the cigarette hit. Hardware companies will always find a way to sell us something we don't really need! I can see less innovation but more cosmetic changes to mods. Style over substance. Having said that, how far away are we from a fully interactive, WiFi enabled IOS/Android driven Pod-Mod-Pad lol! Every coffee shop will have a vape lounge. Well, we can dream! What’s your favourite E-liquid Flavour? Rockstar Vape Strawberry Jam! I am partial to a sweet fruity vape! If you would like to view Gary's Instagram and Review Website then please click on the links below.